It’s late January, Sydney summer, what a hot day. 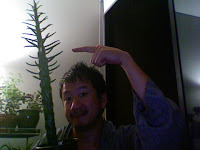 Tomorrow, Monday, is a holiday, since Australia Day was yesterday, and I’m winding down with a beautiful glass of white wine, Georgiana 2007, and am at my mac in front of a rather crazy new succulent that I bought from the Glebe Markets ages ago and only got to my apartment today. As an amusing side, walking along Glebe Point Road, with this succulent (and I really need to take a photo of it), I got attention from people as if I was walking a small, adorable puppy. At least 3 people smiled and laughed and turned heads to look at it, the girl in the chocolate store (do not order the 3 liquid chocolate sampler, it’s too rich!) said “nice cactus”. Steve and I both noticed. It was strange. Perhaps I should take it for walks in Surry Hills too. With a collar and a leash. I am also listening to a Smiths album which my pal Tim put on a CD probably months and months ago, and I never uploaded to my mac until tonight. 3 day weekends can be great for doing little things that you never got around to doing any other time. So, enough context. I simply wanted to ramble about my new poetry book, Bowling Pin Fire, being out. I’ve now got it into 4 stores in Australia (in 2 cities) and will have an extra store and city this week hopefully. Friends are being awfully kind and two have already bought or said they want to buy copies for friends. I’ve found facebook an interesting way to promote it – somehow sending a message on facebook still has a personal feel to it, people don’t seem to feel like they’ve been spammed. I cannot figure distribution at all. My friend in London who pre-ordered from Chapters hasn’t gotten her copy yet. A friend in Northern Ontario who hoped his bookshop would get it in before Christmas is also empty-handed. An acquaintance in the USA got his copy pretty much immediately, also ordering from Chapters, since Amazon, bizarrely, only lists one “used copy” for the bargain price of $80. American. So, I find it amusing that friends have managed to buy it in Australia before friends in Canada since to get it to Australia required 1/ shipping and 2/ Andy getting the books into bookstores. I’ve only sent out 3 review copies here so have another dozen places to send them to. I wonder how our luck will be in Canada, where hard-working Ailise at Signature sent out, wow, it surprised (and pleased me) how many review copies went out. I’ve heard from a lovely woman who reviewed my book for Northern Poetry Review. So, that will be great to see in print – and I hope it’s up on the Internet as well. She engaged with the book and the poems in a way which reviewers have rarely done with my books. I’m grateful. I am happy though, even though I have been getting caught up in the administration of it lately rather than the pride of having it published. It’s been a long journey – and to have the poems out into the world: a gift.